Access Control Intercom is an ideal piece of equipment for many places of businesses, essentially because they offer an added sense of security at various points of entry that are not, or cannot, be manned at all times. Intercoms can be placed at security gates, outside entrances or at internal doorways to high security areas, and can give direct communications with a single Reception-based intercom station if needed, or even to a larger network of security for more complex buildings that need extra security. Access Control Intercom is typically manufactured using strong and solid stainless steel in order to protect the equipment against weather and natural erosion, as well as potential human damage, making the device completely resistant to tampering and vandalism. The units comprise of a single button to avoid confusion, that will link the user directly to the operator of the security system. The system can also include Closed Circuit Television (CCTV) to allow the reception to confirm the person seeking entry as a visual aid, offering extra security for the building or area. 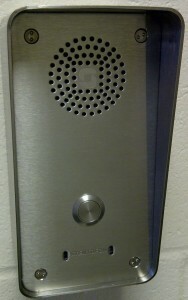 The Intercom also connects to an access control that allows the reception to offer the user entry through a door or gateway, as necessary. The intercom can also be connected up to your company’s PBX phone exchange for out-of-hours, or if your business does not have a reception or person/s to dedicate to communications with the Access Control Intercom. All intercom come with loudspeakers and microphones for indoor use, to aid communication at both sides of the intercom system. Both the AlphaCom E and the AlphaCom XE Intercom Systems can be used to provide full Intercom use for Access Control Systems across one site, no matter how small or large, or even across several sites that do not even need to be in the same country to work effectively, and efficiently.